Mowing a huge backyard on a regular basis can be quite a tiresome affair, which is why you might want to consider getting a self-propelled lawn mower. What to look for in a self-propelled lawn mower? The elements described below play a major role in determining the practicality, success and popularity of lawn mowers – in particular, self-propelled ones. Every self-propelled lawn mower comes with a set of specifications such as its engine’s horsepower, blade’s cutting swath etc. Since they pack a propulsion system too, you’ll have to account for the added considerations like front, back and all-wheel driving, as well as speed settings. Various mowers are built for particular cutting areas or practical lawn sizes. Smaller mowers are excellent for dealing with smaller yards, whereas anything larger will require a device with the power, endurance and fuel capacity to handle the greater expanse. A good self-propelled mower must be able to handle a yard that is, at the very least, a third of an acre in area. Mowing your lawn shouldn’t be the hard work it’s always made out to be – you shouldn’t have any trouble starting up your mower. Whether it is push start or pull start, its engine should kick into life in no more than a couple of attempts. Anything needing more effort i.e. the mowers used back in the ‘90s – aren’t worth your time or money. Gardening equipment such as self-propelled mowers go through a lot of wear and tear because they run on fuel, and also due to friction resulting from the moving parts of both the motor and the blades. All it takes is for their blade to accidentally strike a rock – or to regularly encounter tough weed growth – and your mower can get damaged, forcing you to spend money on fixing it. The majority of mowers these days come with at least a single year of warranty that covers manufacturer faults, which can be detected after a few uses. Choosing the best self propelled lawn mower isn’t only necessary for efficiently taking care of your garden, it is also important for ensuring your physical wellbeing. Even though its great exercise to push a 50 pound mower up a gradient during summer, it does tend to be a lot less enjoyable. You’re buying a mower that doesn’t have to be lugged around manually – so you won’t get the same kind of exercise, but you’ll definitely be a lot more comfortable – and let’s face it, we all need to cut ourselves some slack at one point. This is one of the really popular cheap lawn mowers self propelled produced by Troy-Bilt. It has a smaller motor compared to some of the others that the manufacturer produces, but it comes with an electric start that many people prefer. It has six different cutting heights, with the same kind of cutting adjustment mechanism that is typical of Troy-Bilty. The lawn mower packs the TriAction cutting system, and its deck goes beyond the wheels so you are able to get pretty close to the fence thereby saving you some work with an edge trimmer later on. It can do mulch, side discharge and rear bag discharge, and also comes with a wash port that lets you clean it with ease. Quantum Briggs & Stratton engine, adjustable speed control lever, and an excellent design. and you have to charge the battery before it can be used. 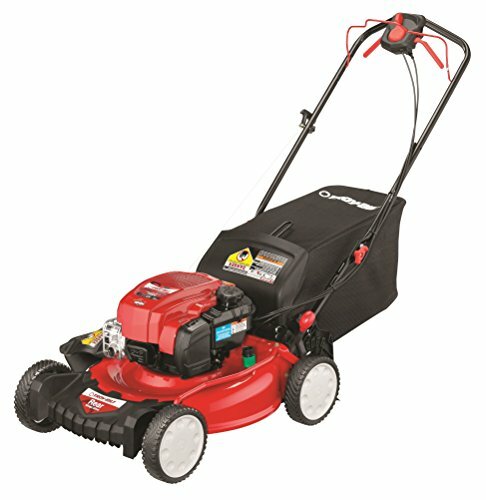 Its electric start capability makes this lawn mower far more convenient than the one you’re probably replacing, and the strong B&S engine will cut through tall grass effortlessly. Keep it charged and you won’t have to experience back ache ever again when you mow your lawn. This is another popular mower that you can easily get at a Sears store. Why is it so well liked? To start off, it packs a hefty 675 Gold Series Briggs & Stratton engine. It also incorporates the Ready Start system that does away with having to prime and choke the engine, making it substantially easy to start. All that you need to do is give it a single pull and you’re good to go. The mower is excellent at four distinct tasks – mulching, rear discharge, side discharge and bagging. It also lets you keep its flap open so you are easily able to remove the bag. Furthermore, the lawn mower appears to be artfully engineered. Superb mulching capability with no clumps in sight. Starts at the first pull. Easily maneuverable and light in weight. The sharp blade is so effective that its cuts the grass near to a fine powder. The front wheels are great at getting a hold of wet grass. Only a few complaints about the rapid movement that occasionally leaves behind a few blades of grass during mulching. Not only is this lawn mower available at a good price – its quality of work and effectiveness have been attested to by dozens of users. It is lightweight, which is why you can easily maneuver it around your yard – particularly valuable for those living in a sprawling property. The bag is also easily removable and, hands down, it will make your lawn look spruced up after it’s through. On top of all this, the height adjustment feature is easy to use, so you can operate the mower in a manner that suits your physique. Bottom line, you won’t find a lawn mower that’s better at mulching than this one.